Another fantastic series of workshops and creative play opportunities were held during the August 2015 school holidays at Serendipity House! Workshops were available for various age groups for children from confident walkers through to 13 years. 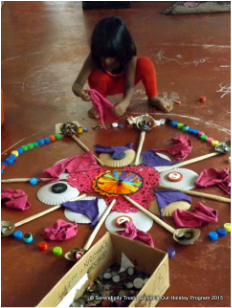 The August 2015 sessions included Print Making, Origami, Cookery, Yoga, Paper Marbling, Play Groups, Sensory Play, Story Telling, Arts & Crafts, Play Dough, Self Portraits, Doll Making, Mask Making, Nature Crafts & Mehendi Crafts. Our twice weekly Play Groups for toddlers also continued throughout the School's Out program. Well over 30% of the total School's Out Tickets were donated to children in need. Click here to check out photos from our August 2015 School's Out Program!